Picture Profile: 1021 The Frank Taylor Memorial Peace Garden Gardening World Cup 2010 COMMISSION. 1021 The Frank Taylor Memorial Peace Garden Gardening World Cup 2010 – Artists impression – COMMISSION. An equivalent event to the Chelsea Flower show in Nagasaki, Japan October 2010. 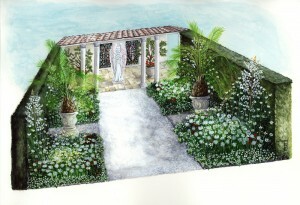 Brief was to produce an Artist’s impression of a garden from a written statement, plant list, and commissioner’s sketch. Photographs were provided of urns, ferns, stained glass windows (rescued from a church and installed in the commissioner’s allotment hut!) from which the alabaster angel figurine was sculpted. All the flowers are white, with a few blood-red blooms. The white for peace and the red for the blood spilled in the Great War. Urgent requirement, completed in good time. A young soldier who died in the Battle of the Somme is being honoured in an international gardening competition next month. Frank Taylor, of Pilsworth Road, was just 17 when he was sent to fight for his country in 1915 and was killed on August 14, 1916 after 11 days facing enemy troops. 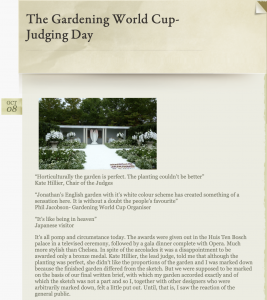 Cumbrian garden designer, Jonathan Denby, is dedicating a peace garden to Frank as his entry for the first ever Gardening World Cup, being held in Japan in October. He learned about Frank’s story after buying two ornate glass windows from Tennants auctioneers in Yorkshire around five years ago. With the help of research from historians Rod Ireland and Ian Lewis, Jonathan discovered the windows came from the old Primitive Methodist Church on Bridge Street. The historians researched the 14 names listed on one of the windows and discovered they were all late soldiers. Frank was found to be the son of James and Amelia Taylor and was a private in the Lancashire Fusiliers. He was 19 when he died. 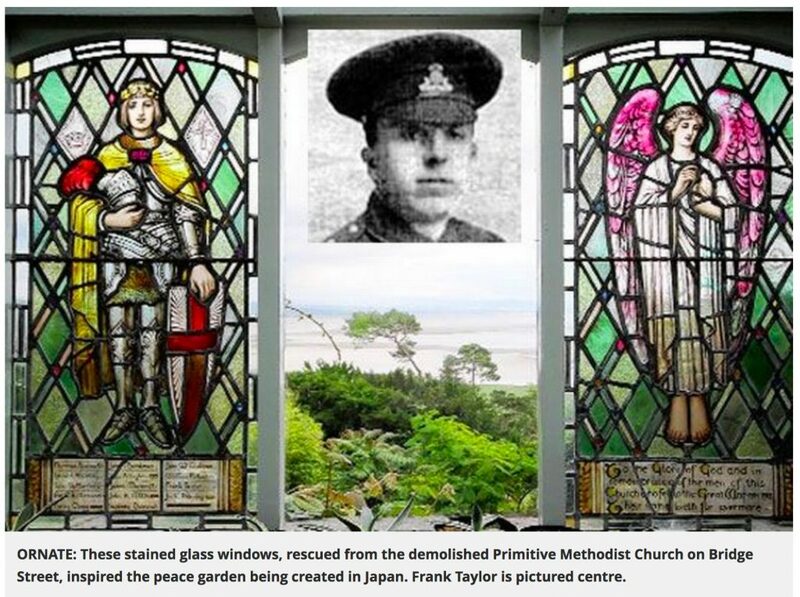 Jonathan has kept the Pre-Raphaelite stained glass windows in his potting shed in Grange-over Sands as a memorial to Frank and says the peace garden will be a tribute to him and the other 13 tragic soldiers. “My link to Frank is through the beautiful stained glass memorial in my potting shed,” he said. “His is a poignant story about a pointless battle in which a million lives were lost and for no decisive outcome. Jonathan only has one very small photograph of Frank and is appealing to any of Frank’s family members, who may still live in the area, to find out if they can help with more images. The Gardening World Cup 2010 takes place in Nagasaki, with judging on Friday, October 8, and Jonathan will be competing against 12 of the world’s top landscape artists. His peace garden will feature a two-metre high statue of an angel found in one of the windows, to be carved out of alabaster by Lancashire sculptor Alan Ward. On either side of the angel will be an olive tree in an urn. The branches of the olive trees represent peace and at their base are red flowers symbolising the poetic line ‘even the olives are bleeding’.